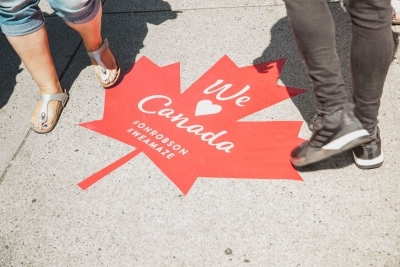 On Sunday, July 1st from 12- 4 p.m., the Robson Street Business Association is teaming up with the West End Business Improvement Association to host a Canada Day street party! The sidewalks from Burrard to Denman Street will come alive with music, entertainment, kids’ activities, delicious fare, business promotions and giveaways. Stand out acts include Dueling Pianos, Derek Pitts, and the Bullets. Additionally, there will be four separate activation zones, including Bute Robson Plaza, the alley between CB2 and Shenanigans, as well as Jervis and Cardero Streets, which will be closed to vehicle traffic. At Bute Robson Plaza, there will be a family-friendly, fun and colourful lounge area, complete with music, face painting, balloon twisting, magic and life-sized games to play. Between CB2 (1277 Robson) and Shenanigans (1227 Robson) is an overlooked laneway, which will be transformed for the afternoon to feature music by DJ Static, hip-hop performances by Diamonds in the Rough and Sweett Moves, as well as live art. Also in this space will be a selection of food trucks and additional seating. On Jervis Street, the second annual Timber Ball Hockey Tournament will be taking place with local brewery teams facing off to win the coveted TBHT trophy. Watch the action from the bleachers or take it all in from the Timber patio with a brew and bite. An exciting new addition this year is the Chill Zone, sponsored by Tim Hortons. The public can put their hockey skills to the test, with $1,000 in gift cards and Tim Horton’s swag up for grabs! There will also be a face painting station for the kids (including the big kids at heart). On Cardero Street, the main stage will feature live music from Marine Drive, Deep Seated and Circus in Flames. Also on site will be face painting, ping pong, and giant Jenga. To satisfy all foodie cravings, Holy Crab will be selling their newest menu items.